What has happened to the Pacific Northwest's sockeye salmon population? ISIS uses California's earthquake to taunt the U.S.
Bardarbunga -- is globally-super-dangerous volcano getting ready to go off? RALPH PETERS: "You do not compromise a vital, above top secret national security information for five minutes of political gain. It's un-American." Obama claims ISIL speaks for no religion. 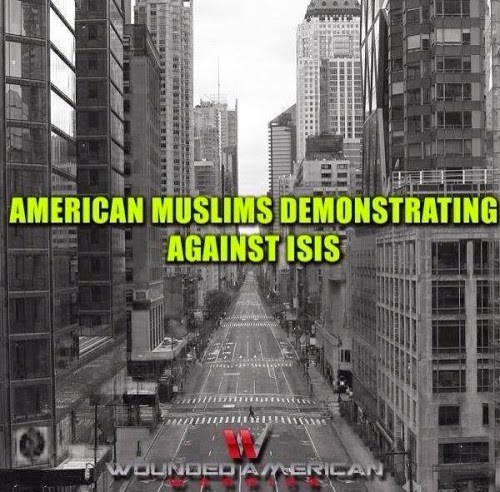 Then what’s the “I” in “ISIL” stand for…? 'We will be vigilant, and we will be relentless." MIKE LUPICA: "When the going gets tough, the tough really do go golfing. [Obama] reacts about as well to the hideous death of Foley as his administration has to the growing threat of ISIS." What message is Obama sending to Israel? Sailing into Oblivion: So how's that gay marriage working out for your denomination? From The Day After, the attack segment on Kansas City, in case you've never seen it. Gazans 'killed' by Israeli shells miraculously return to life. Ralph Peters wants to firebomb ISIS and then kill their "pet goats." Yesterday was August 19. A ‘bot’ report out of Boston several days ago indicated that there might be a ‘level 6’ of martial law here in the U.S. because of ebola. That, thankfully, has not happened. 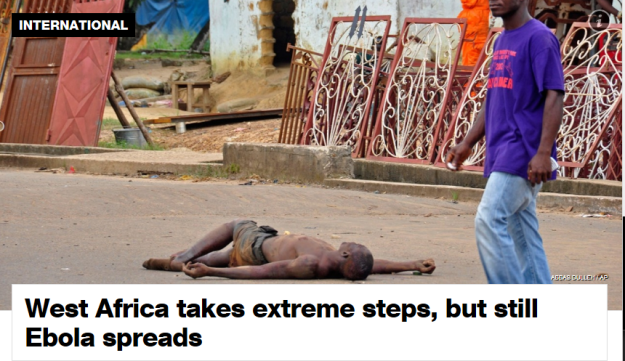 Not because ebola is less of a threat; indeed, ebola is still raging in West Africa with WHO placing the death toll at 1229. However the 'bot' recognized '75 hotspots.' As of today, there have been 68 'scares,' plus waiting on 3. That makes 71. So though martial law has not been declared because of ebola hotspots, the situation in Ferguson, MO, has become a hotspot and is escalating to the point where the police have resembled the military rather than local police, and the National Guard was deployed. There have also been some random protests and marches in support of Ferguson coming from New York City, Washington, D.C., Houston and Los Angeles. Barry Roffman has run a Torah Code on Ferguson and among its implications are that perhaps it was his fear over his role in a convenience store robbery that may have been at the root of Michael Brown’s reaction to Office Darren Wilson. New Orleans Hurricane Exactly 9 Years After Katrina? Because of how the protest had turned more intense on Weds, August 13, on August 14, Governor Nixon ordered crowd control out of the hands of the local police and put the Missouri Highway Patrol in charge of the situation. It was hoped that this change would assure protestors that they did have a voice and were being heard, and that the protestors would disperse. That did not happen. But the connection to Gaza isn't over. Something happened also on Weds, August 13. On Wednesday, August 13, a phone call, described as ‘combative,’ is said to have occurred between President Obama and Benjamin Netanyahu, a phone call that also is described as breaking down into ‘name-calling,’ though we don’t know what those ‘names’ were. Apparently as the conflict raged between Israel and Hamas in the days that led up to the phone call, President Obama did not want some Hellfire missiles sent to Israel, so had the shipment halted. Yes, as Israel was responding to attacks from Hamas, President Obama, the same President Obama who frequently boasts that he has Israel’s back, refused to send Israel a shipment of arms. The decision to hold off on the transfer was most likely on grounds of increased diplomatic tension, the official said, corroborating a Wall Street Journal report earlier in the day that claimed the White House and State Department had been angered by a transfer of arms to Israel and had ordered greater oversight into future sales. So, according to this excerpt from The Times of Israel, John Kerry wasn’t happy about the arms shipment either. ‘. . . strain on ties.” We’ve seen this particular wording before. 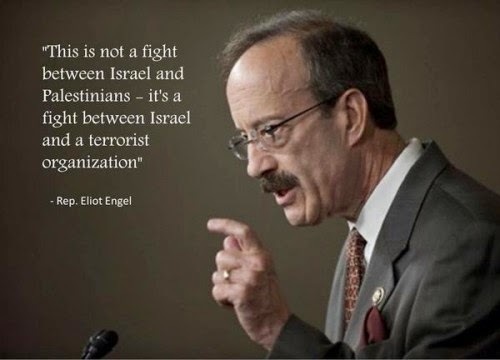 Israel and the Obama administration will begin to strain ties, the ties will come to a breaking point. It might be worth noting that Daniel also notes that as the ties are strained to the breaking point, civil unrest will be taking place here in the U.S. Criticism of Obama for not delivering ‘change’ as he promised in his 2008 campaign has been shouted from the streets of Ferguson. And this cartoon noting the unemployment lines. As Obama refuses to help Netanyahu against Hamas, Ferguson is becoming his own internal hotspot. Interesting that when one takes I-70 west out of Ferguson, one goes thru Columbia (America, Columbia disaster, fireball), past Sedalia (Duduman, nuclear attack) straight into Kansas City (Obama mocking, nuclear attack). FLASHBACK: GOD WILL NOT BE MOCKED. I’ve written several times before about what Dimitru Duduman had to say -- that when some people from the middle of the U.S. began fighting the government, Russia makes a move against us. We saw some sporadic protests last month against illegal immigrants being bussed around the country; however, this situation in Ferguson seems to come a bit closer to Duduman’s warning. First: there are protests, and there is anger against the government, including against Obama. However, there does not seem to be actual fighting against the government, fighting, I would think, that would include heavier weaponry than just molotov cocktails and bottles of urine being thrown at police officers and more than just police officers looking like the military. However, second: Ferguson is in the middle in the country. Curiously, the prophetic word that Duduman gave about the protests . . .
Fourth: The 1983 movie, THE DAY AFTER, is about the Russians bombing the missile silos (the nuclear storehouses) in Kansas and Missouri, including airbursts over KANSAS CITY and SEDALIA. In the movie, Russia sends armored divisions to the border between West and East Germany. (In our current time, Russia is sending armored divisions to the border of Ukraine.) On SEPT 15, the U.S. issues an ultimatum to retreat from the border or Russia's actions will be considered an act of war. Russia refuses. Firing begins the next day, including the ICBMs over Kansas. Part of the movie takes place on I-70 on the west side of Kansas City as a doctor (Jason Robards) tries to survive in the aftermath. Interesting that wikipedia notes that the site of Lawrence, KS, for the basis of the movie was because Lawrence was "agreed upon as being the "geographic center" of the United States, . . . Lawrence was a perfect choice to play a representative of Middle America. The town boasted a "socio-cultural mix," sat near the exact geographic center of the continental U.S., and Hume and Meyer's research told them that Lawrence was a prime missile target, because 150 Minuteman missile silos stood nearby." And wikipedia notes that the people of Lawrence urged scriptwriters to keep the actual name of Lawrence rather than the proposed fictional name of "Hampton." As THE DAY AFTER was being developed, the original director could not complete the project, so Nicholas Meyer, who had just completed STAR TREK II: THE WRATH OF KHAN agreed to finish the film. 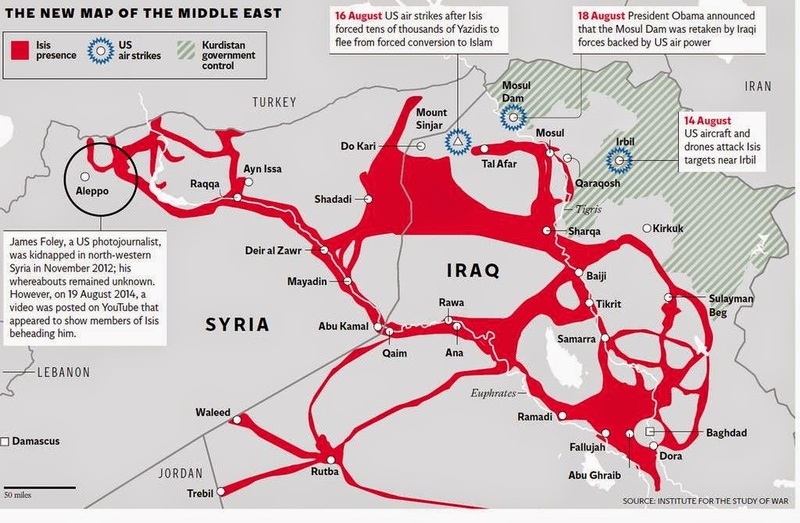 Interesting, as ISIS has been compared to GHENGHIS KHAN and his MONGOLS. The same water tank used in WRATH OF KHAN to create visual effects was also used to create the nuclear mushroom clouds over Kansas City for THE DAY AFTER. And interesting is the wikipedia note that in THE WRATH OF KHAN, Kirk embodies the "restless elements" of Ishmael. KHAN reappears in the 2013 Star Trek movie, INTO DARKNESS. Wikipedia notes that this particular Star Trek is more about terrorism, and "this idea that our enemy might be walking among us, not necessarily on the other side of an ocean." Wikipedia goes on to note that of Captain Kirk, this movie is more about "his crisis of leadership." For THE DAY AFTER, stock footage from de-classified Department of Defense videos of missile strikes was used as well as footage used in the 1979 movie METEOR, which showed the destruction of the WORLD TRADE CENTER. Footage was also used from 1976 football stadium-sniper movie TWO-MINUTE WARNING, and as well as from the 1977 nuclear war movie, DAMNATION ALLEY. Production on THE DAY AFTER began AUG 16, 1982. The Ferguson protests are taking place 32 years later. How much does it cost America to blow up American weapons? 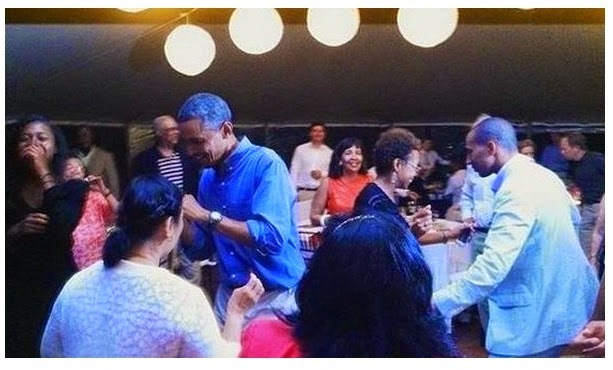 On August 14, a picture of President Obama "dancing the night away" at Martha's Vineyard was discovered Thursday morning posted on Twitter. By Thursday night, it was pulled. 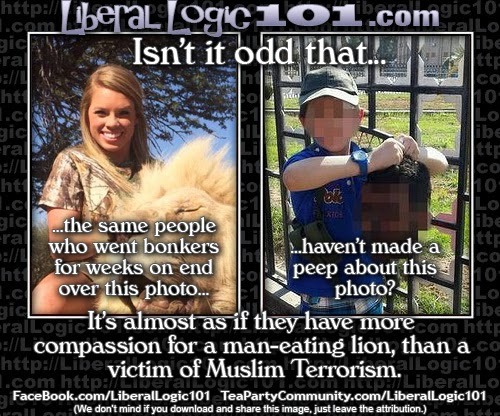 Because the "optics" were "really, really bad." As Obama was dancing, there was an ugly confrontation going on between protestors in Ferguson, MO, and police officers from the Ferguson police department. Tear gas and rubber bullets by SWAT teams were being used to break up the crowd. I Own the World mocked that photo with this photoshop. I have written at this blog before about the monkey god pocket charm that Obama showed the world in 2008, while on the campaign trail. Many Hindus claimed that the little charm was none other than their deeply revered monkey god, Hanuman. 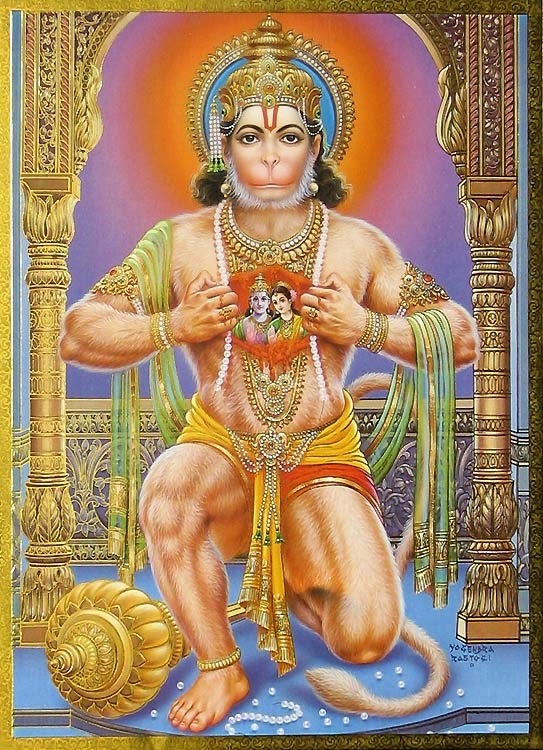 Hanuman is sometimes shown with his skin and bones pulled aside to reveal who resides in his heart. The person is NOT Jesus Christ, but Lord Rama. Lord Rama, the "lord" many worshipers believe will appear, in a different form/avatar, to be savior of the world some day. The Beatles adored Rama with the song "My Sweet Lord." 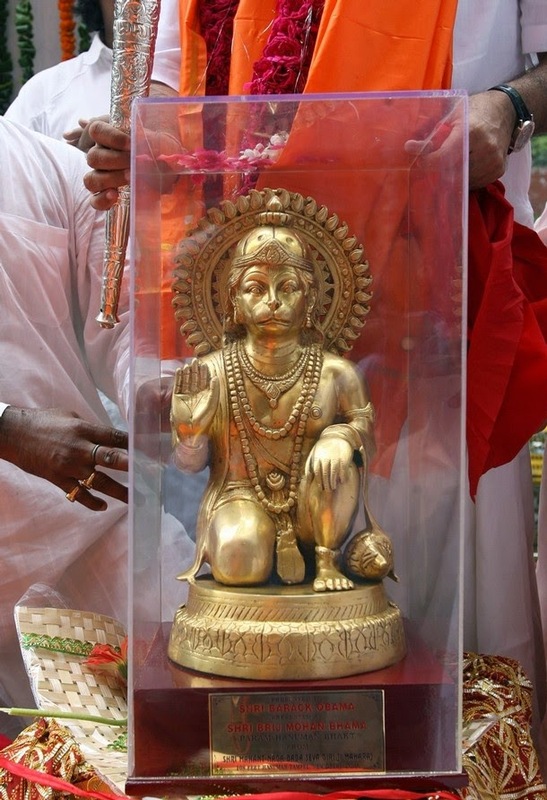 Hanuman worships Rama as Lord and Savior. The day before Obama accepted the nomination of his party to be their candidate for the Presidency, Obama was presented with a "specially blessed" 2-foot, gold-plated idol of the same monkey god. 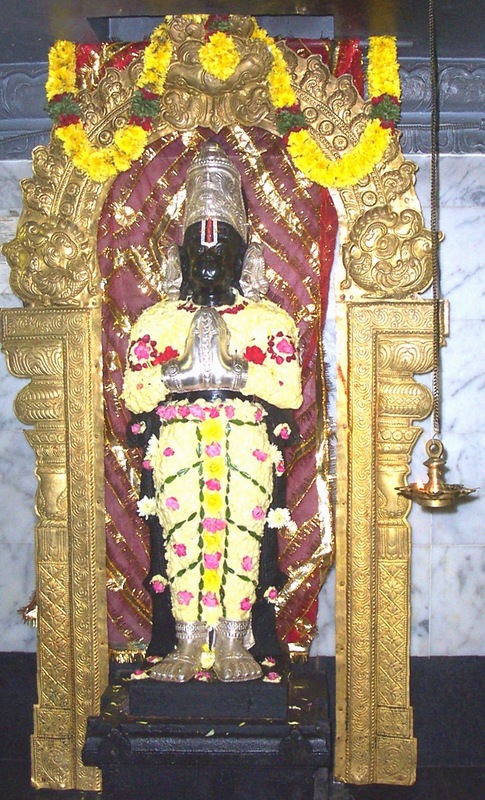 An inscription identified the idol as a gift to "Shri Barack Obama," or "Lord Barack Obama." 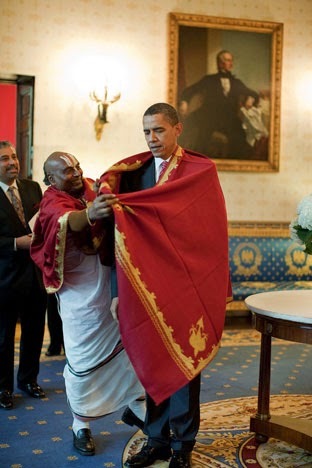 Obama has not been shy about his fondness for Hanuman. He gives space in his book Dreams from my Father to his first encounter with Hanuman as a young boy in Jakarta. He writes with awe of this mighty "god," especially as a fighter of demons. 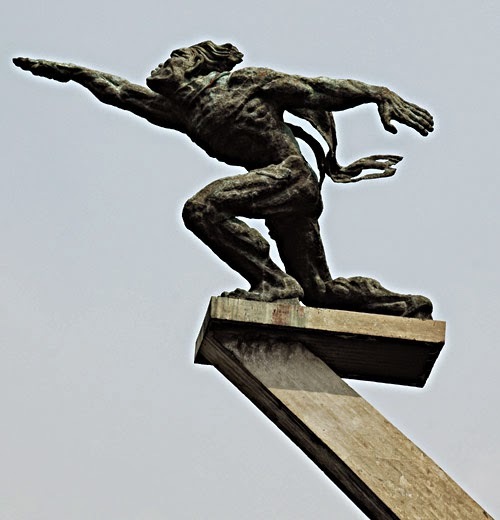 Here is one picture of a Hanuman idol in Jakarta. In October 2009, Obama was the first President to light the Diwali light in honor of Hanuman at the White House and then bow in reverence before it. 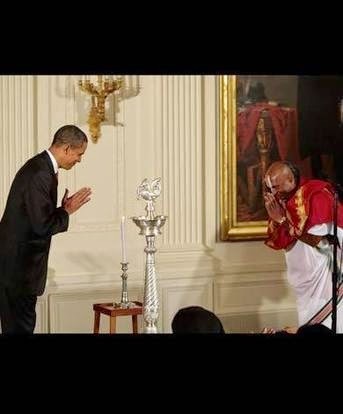 Obama allowed a "senior" priest from the Sri Shiva Vishu Temple temple in Lanham, Maryland to officiate at the service. At this particular temple, its Hanuman idol is the largest in the United States. Obama even allowed the priest to wrap a red shawl about his shoulders. Gifts of candy blessed by this priest and in Hanuman's honor were given to guests. 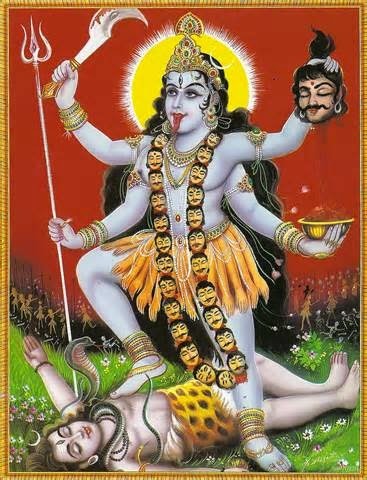 As noted in past posts but mentioned here yet once again, Hanuman is considered by many to have an alternate form, an avatar, and that is of Shiva the Destroyer. 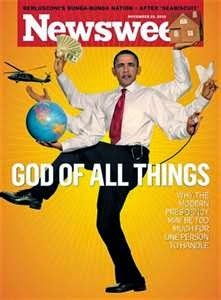 Obama has been pictured as Shiva by Newsweek. 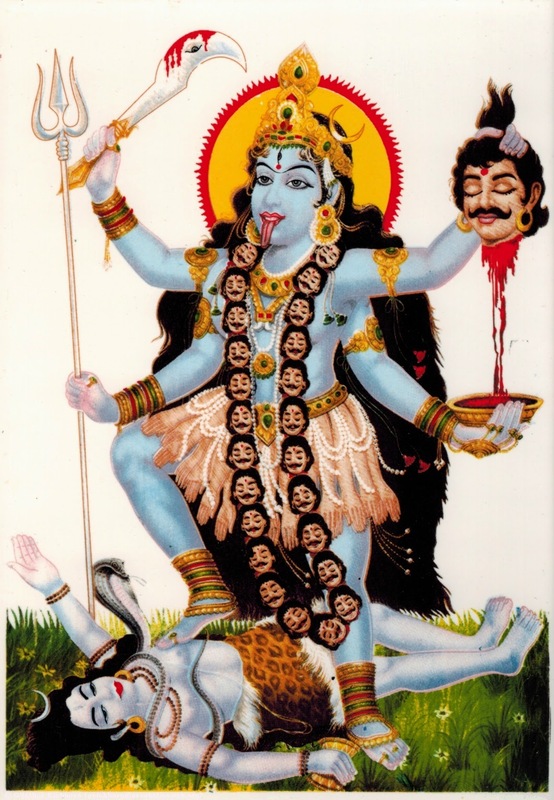 Shiva is considered to have a "female" form, though some say the female is a consort, and that is Kali. 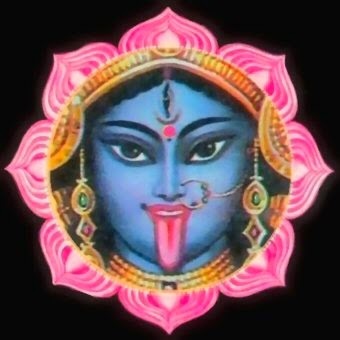 Kali is pictured frequently with her tongue protruding. A trait that is frequently expressed by Miley Cyrus. 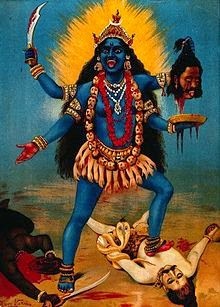 In addition to a protruding tongue, Kali is known to dance upon the body of a dead man (some claim it is the body of Shiva, others claim it is the body of a conquered demon) and at the same time holding the severed head of a man, and in some instances she is shown wearing a necklace of severed heads. Curious that such a viral photo (and subsequent mocking photoshop) would surface at the same time as when ISIS militants have been "beheading" Christians and any who will not convert to Islam, and desecrating their bodies, as they terrorize their way across a large swath of Iraq. 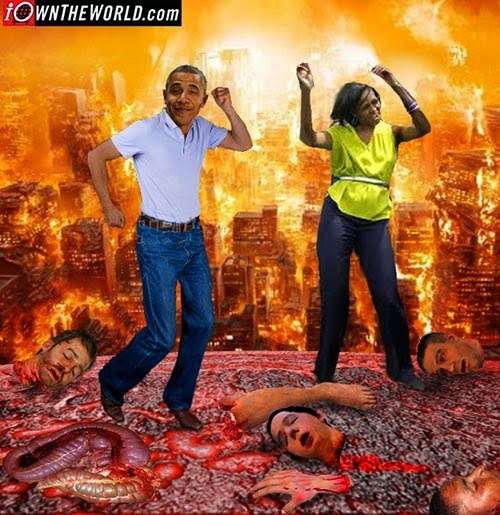 Curious that such a personification of the pocket charm Obama carries would manifest itself and be attributed to Obama in such a way in these photos -- dancing upon dismembered dead as the world burns and is being destroyed. SPECIAL NOTE: BRIEF POST SATURDAY MORNING. In Mission: Impossible II, the pharmaceutical corporation BioCyte engineers a chimera virus in order to create a need for the vaccine Bellerophon, which they had also previously created. The vaccine is only effective within twenty hours of exposure. In Rainbow Six, Tom Clancy posits a plot by a biotech billionaire to wipe out humanity, using a strain of the Ebola virus altered by addition of colon cancer genes. 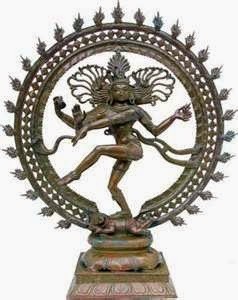 The virus is called Shiva. In Executive Orders, also by Clancy, a previous biological warfare attack had failed because the Ebola virus quickly spreads through a small population, killing everyone, then "burns out" when it runs out of hosts. in reality Ebola has caused a number of small outbreaks but no large epidemic, and the U.S. government had launched an effective public health response—led by the CDC and epidemiologists from Johns Hopkins University—which contained each outbreak and quarantined all patients. Despite ingenious use of aerosols to spread the virus at a number of large trade shows, only five thousand were killed. Did Obama pressure Israel with missile cutoff last month? To learn who rules over you . 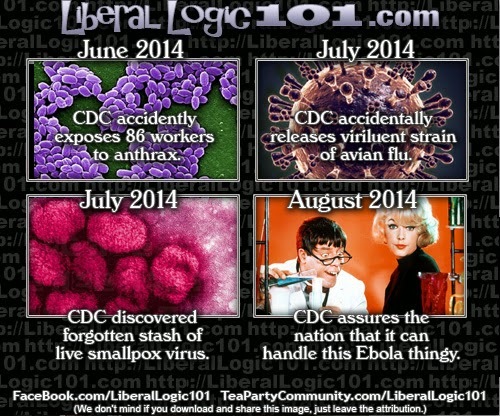 . .
How in the world is it possible that more than 170 health workers have been infected by the Ebola virus? 5 Reasons there won't be an ebola outbreak here in the U.S.
About that Mosul Dam . 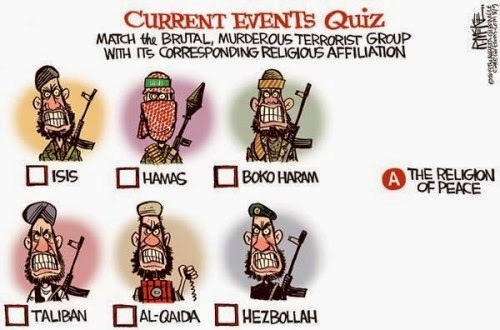 . .
FLASHBACK, JUNE 29, 2011: Obama administration claims Jihadists' Caliphate 'absurd'; yet three years later to the day, on June 29, 2014, the Islamic State of Iraq and the Levant (ISIL) announced that it now ruled large swaths of Iraq and Syria as a caliphate. Bill Whittle gives a great breakdown of what is happening right now between Israel and the terrorist group Hamas in Gaza and that President Obama just gave $400,000,000 of our tax dollars to Hamas. Yes, $400,000,000 to a sworn enemy of Israel. Woe! Remember this from a few days ago? Check out what those tunnels cost. 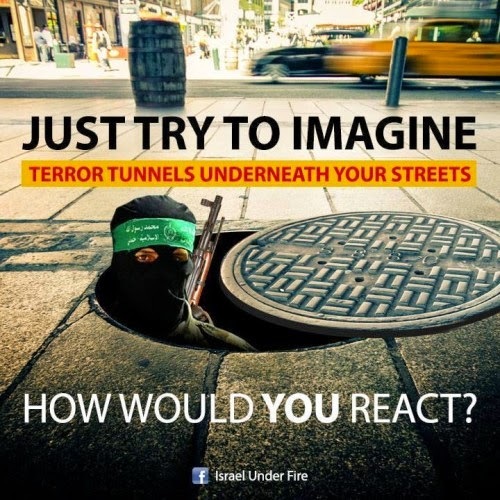 So here's our old-school math problem: Hamas Bobby wants to buy a tunnel toy car. 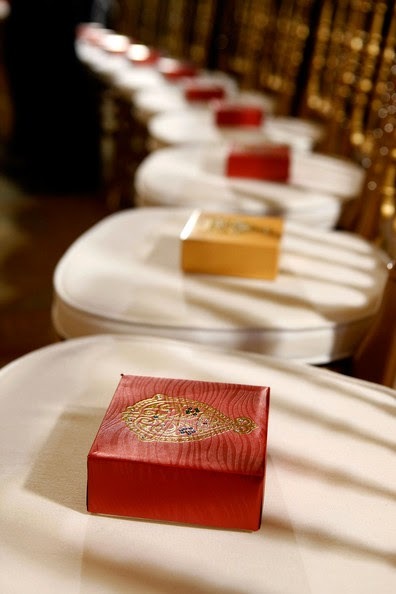 They cost 3 million 3 dollars each. 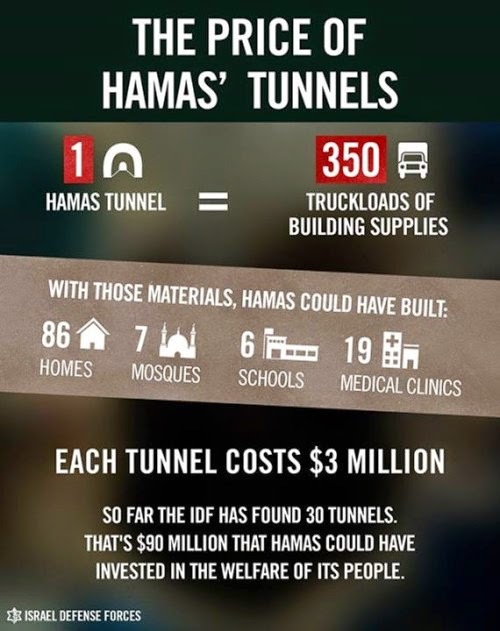 How many tunnels toy cars can Hamas Bobby buy when his best friend gives him 400 million $400? Obama: "I don't worry about Israel's survival." 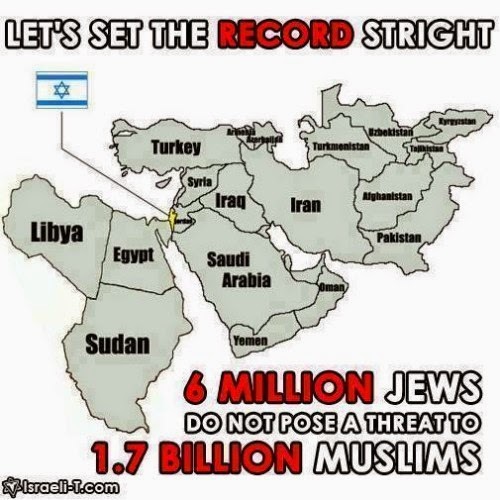 And I Own the World posted the following 2 YouTubes, asking, if Hamas wins the war against Israel, do you really think their savagery will stop? H/T to Interesting Items for posting this YouTube. 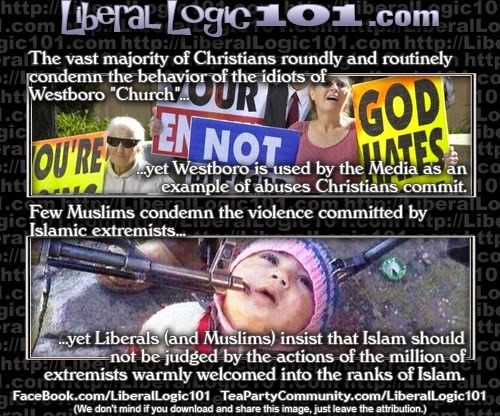 Warning: Graphic, graphic content, but clearly, biblical prophecy coming to pass. Fidockave213 (also known as Seventhvial213) includes some horrifying footage of ISIS, which is an evil that is coming upon the face of the earth unlike anything seen in our lifetimes, and the severe Ebola outbreak, which does not appear to be receding anytime soon. 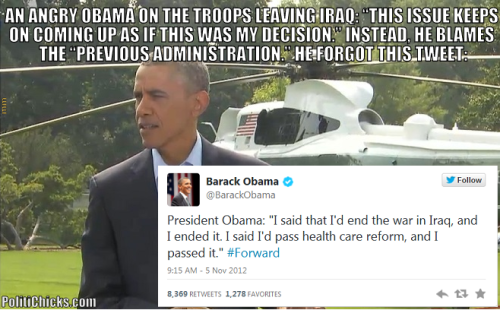 Obama: "Pulling troops out of Iraq was not my decision." Google search has death toll still at 961 from August 8. Found no new death toll update. 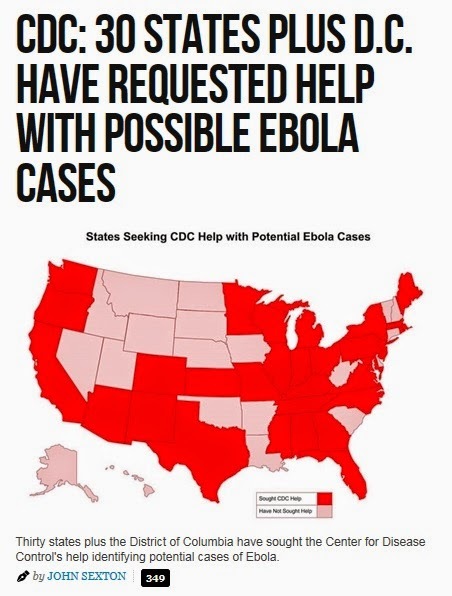 EBOLA IN U.S. BY AUG 19? AUG 10: Boston expert claims "bot" spotted ebola outbreak in West Africa nine days BEFORE it hit the press; says "At this time it has not been announced that Ebola is spreading in the U.S., but predictive models show that we may be less than 9-days away from some type of official announcement based on current data," identifies at least 75 potential triggers in the United States along with potentials in Canada as well as Mexico. 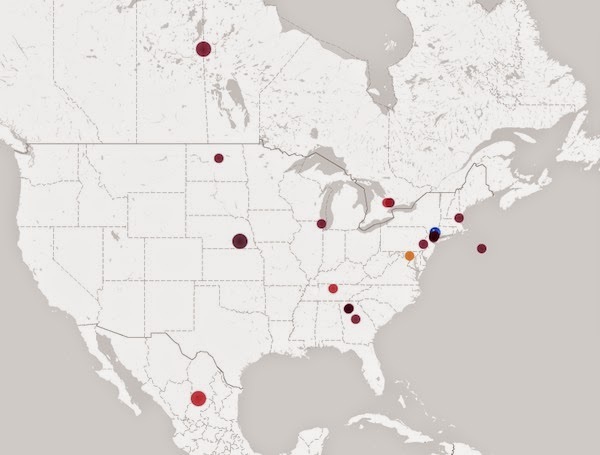 What Ebola outbreak would look like in U.S.
Was a 2-year old the "Ground Zero" patient? 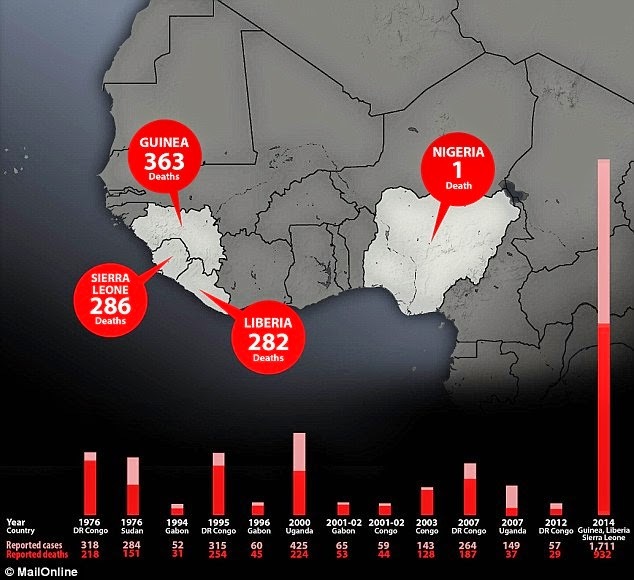 Nigeria Declares "State Of Emergency" As Study Finds West African Ebola Virus Is Previously Undetected "New Strain"
GULF OF MEXICO: Gulf Of Mexico Dead Zone Is As Large As Connecticut! LGBT: Federal contractors vow to fight Obama executive order, claim Obama's "sweeping changes threaten the due process rights of federal contractors and conflict with existing federal procurement and labor law." Family members are dragging dead ebola victims rather than face quarantine; victims are now being cremated rather than buried. Questions are being raised about the possibility that terrorists might attempt to secure ebola and place it in a form that could be used as a bioterror weapon. In 2013 Global Policy, a journal produced by the London School of Economics, warned about the prospect of Ebola being used as a terrorist weapon. If ISIS manages to defeat the al-Assad regime in Syria it may come into possession of biological weapons. According to U.S. intelligence the Syrians have a biological weapon program run out of the Scientific Studies and Research Center (SSRC) in Damascus with labs in Aleppo and Homs. Might this be the reason why Damascus is reduced to a 'ruinous heap,' according to Biblical prophecy? Could Damascus be destroyed as the result of an effort to destroy the lab there? However, according to Obama, ISIS isn't really a worry. At least Obama does express some concern about ebola.